I love hearing how different people use coconut oil. In this article, Jenny first explains how she uses coconut oil for both her hair care and skin care. One comment that leaped out at me was that the wrinkles under eyes have disappeared and also her age spots have started to fade since using coconut oil on her face. That’s pretty amazing. 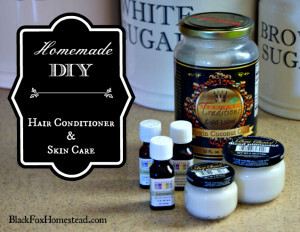 She then shares her recipes for Homemade Coconut Oil Hair Conditioner and Homemade Coconut Oil Moisturizer. Both recipes use some of my favorite essential oils. She includes notes on how she uses each recipe. Excellent article. Please visit the Homemade DIY Coconut Oil Hair Conditioner and Skin Care link below to read the full article.